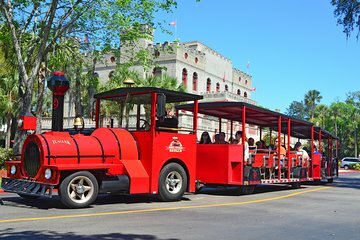 Explore St Augustine with ease on the Ripley’s Red Train, a hop-on hop-off tram with more than 20 stops at historic sites, attractions, restaurants and shopping zones. The trains run every 20-30 minutes from 9am to 5pm, and the full tour lasts about 90 minutes. Hear onboard commentary about attractions such as the Castillo de San Marcos and Lightner Museum, and choose to book either a 1-day or 3-day pass. Amazing trip. Guide/driver knew alot about history. Great stores/eateries to visit. Beautiful, just absolutely beautiful views to see. It was so fun. The Fort was cool. Hop on hop off is a great way to visit and learn. We had a very enjoyable, informative ride! I accidentally booked our tickets for the wrong day, but the staff said it wasn't a problem and honored the tickets. The drivers were very knowledgeable and fun! We loved the sights we drove past, and we hopped off to have lunch and wander around a bit. We only waited a few minutes for another train to hop back on to continue our tour. This was an excellent way to tour St Augustine! Navigating the narrow streets and searching for parking would have been a mess! Will recommend Ripley's Red Train Tour to my friends. Excellent tour, stop at the motel.